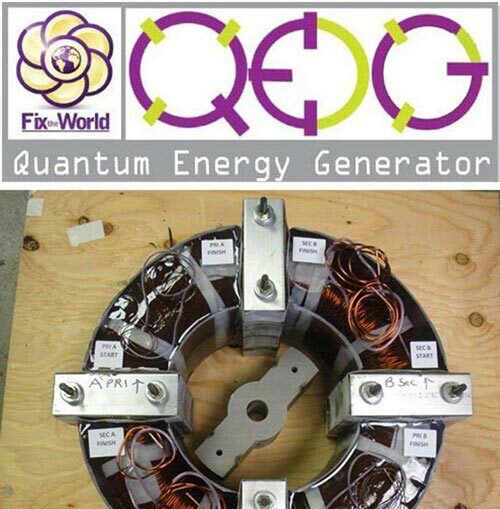 During March of 2014, the Quantum Energy Generator (also referred to as QEG) became open sourced and since that time teams around the world have been in co-development to bring highly efficient power to a person’s home. The QEG was first discovered by Nikola Tesla, whose patent on the “Dynamo-Electric Machine” is the basis for this project. The patent was filed in the beginning of October in the year, 1888. Simply put, the purpose of this project is to try and create a prototype for a modern day fuel-less generator. The energy that will be used from the successful completion of the product will be different than traditional generators. Considering the QEG project is working on a prototype, at first, scaled models are being created. These scale models are projected to produce power in-between 10 and 15 kilowatts (kW). The power generations will be continuous. The continuous power will allow for one phase output that can give either 120 Volts or 230/240 Volts. The plan of this project is to create larger generators with more outputs. Currently, there is a 3-phase power outlet planned for the future. One of the beauties of this project and these deceives, that it seeks to create, is that they will, just like Tesla intended, work harmoniously with natural laws. Currently, standard generators waste a great deal of power because of their symmetric motor. These wasteful generators are currently the main source of energy in mainstream industries. The Quantum Energy Generators are designed to be extremely easy to use and maintain. They are being designed to be as efficient and hard working as refrigerators and washing machines. These devices do break down, but it is rare and will usually only happen after many years of prolonged use. Many of the technologies and components that go into helping this project are already established but have been traditionally under-utilized. For instance, there is the power oscillator configuration. This component helps to start the generator. Many people and teams throughout the world are looking into different ways to make the generator work more efficiently. Toroids and bobbins are also a big component of creating these new generators. Although a toroid coil has wide sweeping functions throughout society, their use in this project has helped to make an idea come to life. A finished QEG coil can, and will do so many amazing things for our society as we continue to move to sustainable energy sources.